I’ve become totally enamored with Claire Nereim‘s work. For a long while I’ve been eyeing it on etsy. We’re trying to keep our home sparse, so I’m attempting to curate thoughtfully. But I had no qualms about purchasing Claire’s beautiful, graphic, and delicate work. The problem is, I want more of it now that I have one piece. 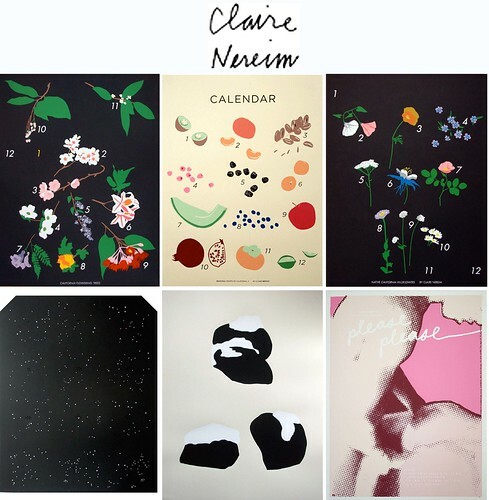 In the next issue of Truant (coming soon) I even chose Claire’s wildflower calendar as my holiday gift wish. I told Dave in passing. Then I contacted Claire to see if she’d like to do an artwork trade! She said she’d love to. However when I shouted out in excitement from my desk, Dave told me he’d already ordered it for me! I’m so thrilled. Now I have my eye on her constellations, or even her flowering trees (see both above). Oh Claire! I was lucky to grow up in a house full of art with parents who encouraged creativity. I have been making art my whole life, but only a few months ago was able to take the leap and be creative full-time. When you were a kid what kind of materials did you like? I have always loved to draw with pencils and to cut paper. I made little books and signs for things. I loved dressing up and organizing things in my room and in our house. What led you to printing? I am also a musician and in high school made album art and posters using photocopiers. At Oberlin, where I went to college, there is an amazing screenprint studio, and I started printing there. I was inspired by the history of type and other printed materials, and really connected with the process. Do you prefer your own projects or commercial projects? I could fill all of each day with my own projects, but I do love to collaborate. Working with other artists and for arts organizations, record labels, musicians, and magazines has been wonderful. An ideal situation would be to have a balance of my own projects and commercial work. I am always compelled to challenge legibility, and I’m still searching for the right ways and places to do that. What inspires you inside your home? Reading books, listening to music, blank paper, sunlight on the walls, the sticks and stones I bring home, the newspaper. What inspires you outside your home? I love the swimming pool, astronomy, medieval tapestries, and the work of artists Roni Horn, Katharina Fritsch, Jockum Nordstrom, and so many others. I am lucky to live in San Francisco, where I can take bicycle rides to the ocean and the old-growth redwoods, which are always inspiring. If you could design your dream studio where would it be and what would be in your space? I am currently working and living with my boyfriend in a small triangular apartment which is lovely in many ways, but my dream studio would be larger and have at least one square corner. I would keep the walls pink, keep my printing table, and get a drying rack and exposure unit, a tabletop press, an industrial sink, and more flat files. I love having natural light, empty table space, and piles of art books to read and look at. Right now I’m working on mapping a new set of constellations, some new drawings, flags, and a T-shirt line with my friend Julie Cloutier. I am going to start work on a new calendar in the new year, but I’m taking a short break from printing after a few weeks of nothing but! I hope you enjoyed reading more about Claire and seeing her lovely work. Have a splendid weekend dear readers! great interview. I’m familiar with her fruit&flower calendars but your post introduced me to her other pretty posters 🙂 thanks! oh goodie!! So glad I could add to your appreciation of Claire’s work. She’s amazing. Wonderful!!! She’s so nice, I was happy to find out more about her too. thanks Su Ling!!! She’s really wonderful. I love her style and really enjoy her prints in my house! Glad you like her too.